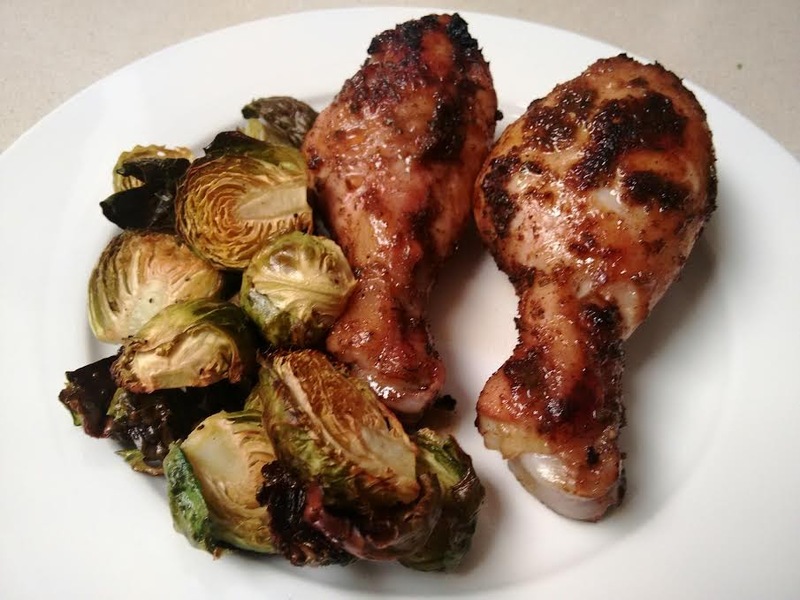 A couple weeks ago, I made Slow Cooker Jerk Chicken, which was so tasty, I wanted to try a marinade for roasted chicken legs. I made a few adjustments to this traditional marinade recipe. First, I cut the recipe in half to make enough just for one dinner, because I didn't want leftover marinade. The halved recipe was the perfect amount for the package of 14 chicken drumsticks we had. Second, I don't drink juice, so I didn't want to buy an entire container of orange juice just to use a small amount in the marinade, so I used lemon juice instead and used molasses to cut the sour flavour. You can use orange juice, but cut the molasses in half. Lastly, I used Fresno chili peppers because Scotch Bonnet peppers are hard to find, and I have a Fresno chili plant at home. Fresno chilis are milder in heat than Scotch Bonnets, so I used three of them. Fresno chilis are just slightly hotter than jalapenos (and much smaller), so you can adjust the heat to mild by using just one, or medium heat by using two or three. You can marinate chicken drumsticks or thighs in this sauce for 1 to 2 hours ahead, or you can brush it on to the chicken just before roasting or barbecuing. The marinade can be used right away, or can be made up to 48 hours ahead and refrigerated. Place all ingredients into a food processor or high powered blender. Blend until smooth, scraping down sides of food processor as needed. Preheat oven to 400 degrees F. Line a baking sheet with aluminum foil, then grease foil with canola spray. Place 12-16 chicken drumsticks on foil, evenly spread out. Brush chicken drumsticks with jerk sauce, then flip drumsticks over to coat other side. Place in oven, then remove after 25 minutes to flip drumsticks over. Place back in oven and roast for an additional 15-20 minutes, until chicken is fully cooked and skin is crispy.